"I saved one month of development time, and approximately $12,000 using Iron Speed Designer." Emma runs an online business selling handmade teddy bears. She has been making the cute bears for about seven years, selling them on Etsy.com, Bear Pile, and eBay. The new application gives Emma a place to showcase all of her loveable creations for potential clients. A catalog of handmade Emma's Bears available for adoption. 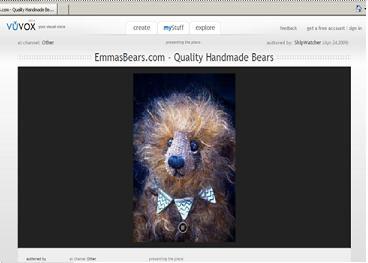 When Emma completes a bear, she logs into the admin section of the application, uploads photos of her new creation, and enters a description. Although she doesn't understand HTML, she uses the Iron Speed Designer rich text editor to format attractive descriptions in multiple colors and fonts to suit her creative ideas. Each bear has its own page and description. As each bear is added, the site automatically creates an RSS Image Feed that generates a promotional slide show. The slide show can be displayed on other websites. 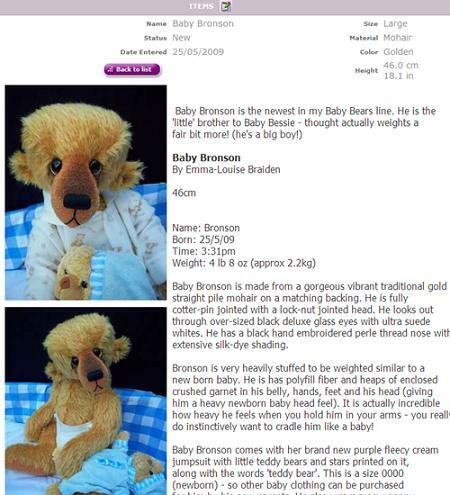 Emma's Bears slide show is updated automatically every time she adds a new bear. I also use the RSS feed to automatically update Emma's Twitter profile. Every time she uploads a new bear, a quick description gets sent to Twitter, intermingled with her manual "tweets" at http://twitter.com/emmasbears. After the bear is added to the site, it is publicized on Twitter, and various blogs that display her slideshows. Interested people go to the website and are able to browse through her inventory by price, size, color, material, etc. They find the bear that they'd like to "adopt", click on the "Buy it now" link, and become the proud parents of a loveable teddy bear. 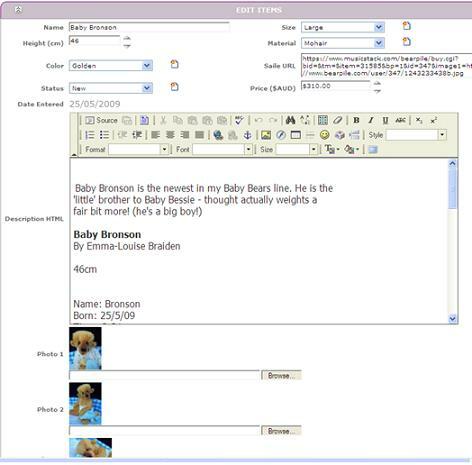 Editing the bear description is easy using the Rich Text Editor, even though Emma doesn't know any HTML. Emma lives in Australia and her prices are in Australian dollars. The website looks up an external currency conversion web service, and then also displays all prices in United States dollars. Emma has a link to the eCommerce site to handle her sales. We decided there was no need to duplicate the checkout and payment functionality in our website since e-commerce sites already do this efficiently. Emma's Bears is a new application utilizing one Microsoft SQL Server 2005 database, ten database tables and 138 web pages. The largest database table is the Items table, which has 36 rows. It is difficult to say how many users access the application, but she currently gets around 2,000 page views a month. Emma adds six to eight bears per month to the website, and sells about one or two bears per week. The project took me one eight-hour day to implement. The Iron Speed Designer portion took half a day. Link to XML Web Services to download currency exchange rates. Utility to generate an RSS image feed from database tables. No third-party components were used, but I did reuse some code from another Iron Speed Designer project to generate the RSS feed. I used the standard Baker page style in Iron Speed Designer. I saved one month of development time, and approximately $12,000 using Iron Speed Designer. I would not have undertaken the project at all without Iron Speed Designer. I don't have time to create .NET applications by hand. There are no plans to extend the Emma's Bears application. However the website was designed in such a way that it could be reused for anyone selling products online. Neil Ennis has a Bachelor of Science, University of Queensland, 1981. He is the creator of the popular IBS Finance and Tango32 loan management systems. His software has been used by lenders throughout Australia, the South Pacific and the UK since the 1980s. Neil founded Expert 1 Pty Ltd in 2004. It specializes in the development of Loan Origination and Loan Management software with interfaces to most major banking systems and credit agencies. Neil is an enthusiastic cruiser and built the ShipWatcher.com website as a free service to lovers of cruise ships.